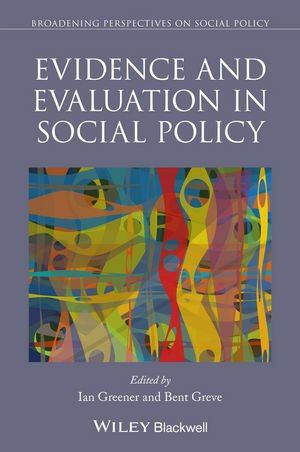 By examining the role of evidence in social policymaking and the extent of its influence, Evidence and Evaluation in Social Policy delves deeply into one of the central questions of the field for the last 20 years. Bent Greve is Professor in Social Science with an emphasis on Welfare State Analysis at Roskilde University, Denmark. He is Regional and Special Issues Editor of Social Policy & Administration and has published extensively on social and labor market policy, social security, tax expenditures, public sector expenditures, and financing of the welfare state. He is the author of Happiness (2011) and the editor of The Routledge Handbook of the Welfare State (2013) and Happiness and Social Policy in Europe (2010). Ian Greener is Professor in the School of Applied Social Sciences at Durham University, UK, as well as being Director of the ESRC North-East Doctoral Training Centre there. His research interests include the use of evidence in policy, healthcare reorganization, and the means by which policymaking can become more evidence-driven. He is the author of three books on research methods, public management, and healthcare, including Designing Social Research: A Guide for the Bewildered (2011). He is also the author of over 50 peer-reviewed journal articles, mostly concerned with health policy.